Strattera (atamoxetine) is a prescription medication that is given to patients who suffer from Attention Deficit Hyperactivity Disorder (ADHD). Unlike other medications for this disorder, Strattera is not a stimulant and poses less cardiovascular risks than other ADHD medications such as Adderall and Vyvanse. Strattera is not as habit forming as other medications developed for the treatment of ADHD. Patients who suffer from mania or bipolar disorder, glaucoma, suicidal thoughts or attempts or who are pregnant should discuss these issues with their physicians before beginning treatment with Strattera. This medication can help patients with attention deficits focus on tasks, improve attention spans, and help provide emotional stability. 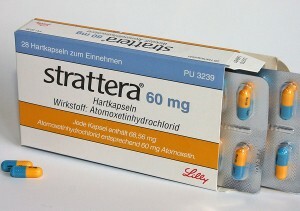 Strattera is available only via prescription and is produced by the pharmaceutical company Lilly. It is not available in a generic form or produced by any other drug company. Strattera is generally taken once daily with a full glass of water, with or without food. Patients who take Strattera twice per day and experience trouble sleeping should take their last daily dose before six o’clock in the evening to prevent sleep interruptions. This medication should always be taken exactly as prescribed and patients should never stop taking their medications except under the supervision and advice of their physicians. Strattera can be used in children as young as six years of age but special precautions will apply when given to children this young. This medication should never be shared with others; it is a prescription medication intended for use by the patient alone. ADHD is a condition whereby an individual is hyperactive and finds it difficult to concentrate and control their impulses. There are three subtypes; the inattentive type where the person finds it difficult to concentrate; the hyperactive-impulsive type where the person has constant impulses to run around and has difficulty in quiet activities, and the combined type which is a mixture of the two. The condition is usually present before the age of seven, and is a common condition in children, resulting in difficulties at school and at home. ADHD is caused by a mixture of different factors; there are some genetic predispositions, and in-utero exposure to tobacco and alcohol has also been linked to this disorder. The social effects of poverty, the education system and parenting style also play a large role. The treatment is equally varied, combining parental training techniques, classroom teaching styles and medications to manage these children. It is not really known how Strattera treats ADHD, although it is speculated that its effects on the neurotransmitter norepinephrine are significant. Strattera reduces the symptoms of impulsiveness and hyperactivity, and increases concentration in affected children. Strattera has several advantages over stimulant medication in treating children who require medication for their ADHD. Firstly, its effects last for a longer time period in the body than stimulant drugs. In addition, it does not have the potential for abuse or value on the black market that stimulant treatments for ADHD do. It may also work in children for whom stimulant medications are not effective. You have used a group of medications called Monoamine Oxidase Inhibitors (MAOI’s) in the past two weeks (examples include rasegiline, selegiline, moclobemide, phenelzine, isocarboxazid, and tranylcypromine). You should also inform your doctor if you are pregnant, breast-feeding or planning to become pregnant as this can affect your treatment with Strattera. Strattera should be used for a couple of months before deciding if it works for an individual or not, because it can take a while to have an effect. Strattera should be taken exactly as prescribed and never more or less often than recommended. Patients can develop a physical dependence to the drug, so it is important that they never stop taking the medication without the express approval of their physicians. The capsule should be swallowed whole and never opened or broken; the medicine inside the capsule can be extremely dangerous if it gets into the eyes. If this occurs, immediately flush the eyes with water and contact a physician. If a dose is missed, it should be taken as soon as the patient remembers unless it is almost time for the next dose. In this case, the patient should simply wait until it is time for the next dose. Adderall is a psychostimulant that combines both amphetamine and dextroamphetamin to increase levels of dopamine and norepinephrine. Methylphenidate, better known by the brand name Ritalin, is a mild stimulant that increases the neurotransmitter levels in the central nervous system. Clonidine is a generic medication used to treat hypertension, or high blood pressure; a commonly used name brand version of this drug is Catapres.